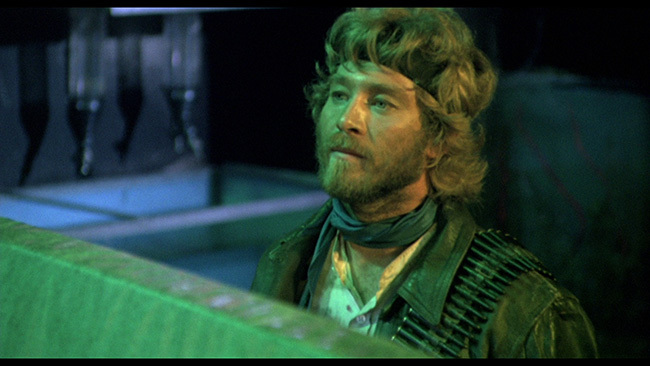 Bruno Mattie’s 1984 picture Rats: Night Of Terror is set in a post-apocalyptic future of 225 A.B. (yes, A.B., that’s not a typo – it stands for After The Bomb!) and it brings us into a world where civilization as we know it has fallen. Society lies in crumbles and many of the few humans left now live the lives of scavengers, often taking shelter underground. 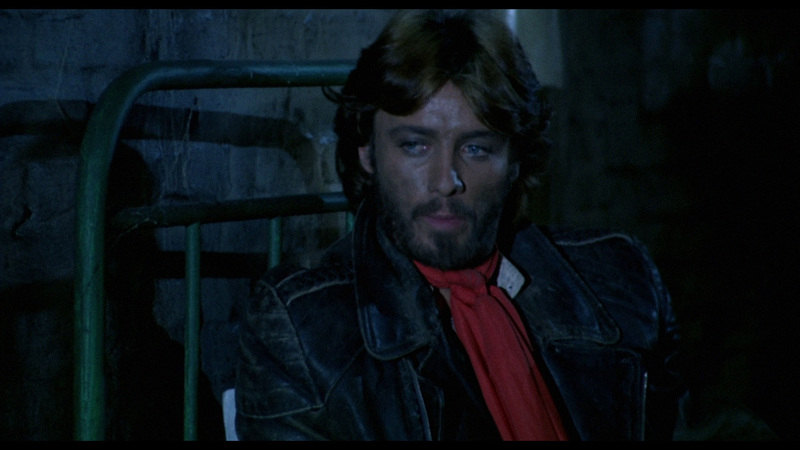 Into this world comes Kurt (Ottavniano Dell’Acqua), the leader of a biker gang made up of a black chick named Chocolate (Geretta Geretta), Taurus (Massimo Vanni) and a few other characters with goofy names… Video (Gianni Franco) for example. Their travels bring them out into the desert where they find an abandoned ghost town that is ripe for the picking – there are plenty of food rations and other valuables and they decide to make themselves right at home. Eventually they realize that under this town is a huge underground city, the location of a former science experiment. It turns out the inhabitants were eaten alive by the hordes of rats that now call this place home. As Kurt and his pals roam around, they too come under attack from the killer rodents who, since the bomb was dropped, have mutated into smarter, stronger, faster rats than have ever been known. Will the recording they discover left by one of the dead scientists be enough to help them survive or will they too fall prey to the beasts? 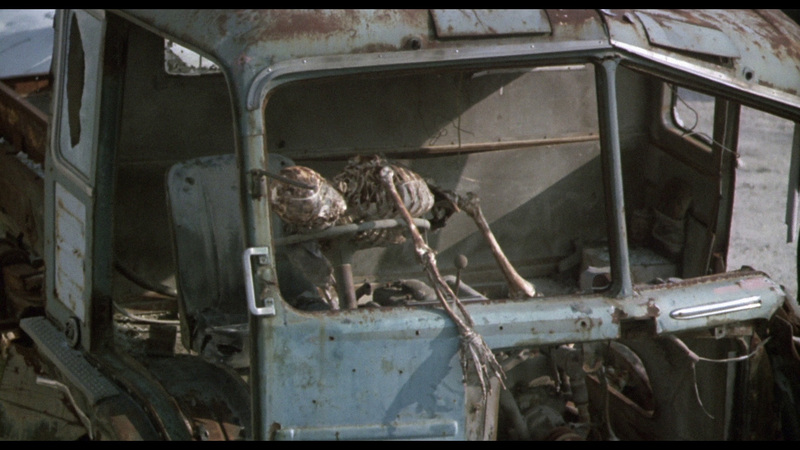 Mad Max meets Willard? Sounds like a solid idea in theory but this is more like New Barbarians meets Deadly Eyes except not nearly as good as either one of those films. 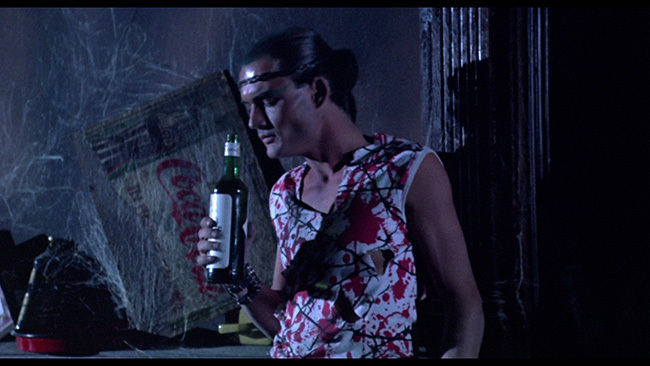 Once again Mattei’s well-known penchant for disregarding logic in favor of poorly staged exploitative set pieces is in full reign while the cheapjack production values and absolutely horrible eighties era ‘apocalypse punk’ wardrobe choices scream ridiculous dayglo screams of the era in which this picture was made. 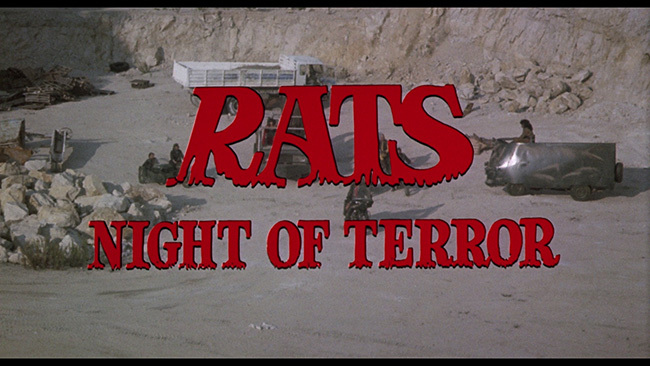 What the film lacks in gore and boobies (we get noteworthy doses of both but not on the same level as some of Mattei’s better pictures), Rats: Night Of Terror makes up for, sort of, with guinea pigs died black (with the one infamous exception wherein Mattie and company opted to just glue a bunch of fake rats to a conveyor belt!). 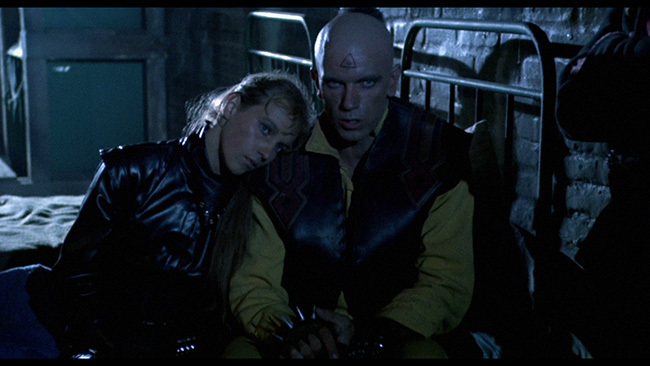 These creatures and their beady red eyes roam the darkness of this horrible future bringing certain doom to annoying characters with yet more awful dubbing. Some will object to some scenes involving the obvious harm of real, live guinea pigs, others will just shrug and accept it for what it is and the climate that existed in the Italian film industry at the time. This one moves at a considerably better pace than Hell Of The Living Dead (a film it was double-featured with in North America via Blue Underground) and it’s chock full of ridiculous, nonsensical dialogue. It’s still a horrible film though. 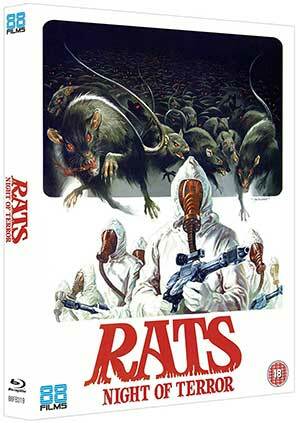 Rats arrives on Blu-ray from 88 Films in a ‘remastered’ presentation presented in AVC encoded 1080p high definition and framed at 1.85.1 widescreen. The feature takes up over 26GBs of space on the 50GB disc. The transfer is clean and very colorful with strong black levels. Compression isn’t ever really a problem and the image is free of all but the most minor instances of print damage. There does appear to be some DNR here, however, as skin tones look a little waxy. Otherwise, no complaints. Audio options are provided in LPCM Mono in your choice of English or Italian language tracks. Optional English subtitles are included that translate the Italian audio option. Both tracks sound fine. They’re properly balanced and quite clean and easy to follow. 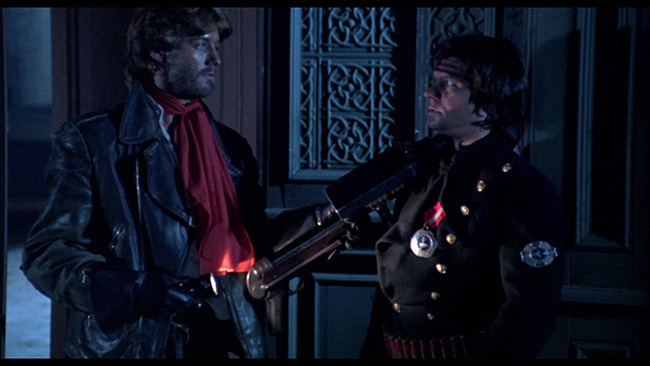 Extras on the disc start off with a new interview with stuntmen and leads Massimo Vanni and Ottaviano Dell'Acqua entitled Of Rats And Men. 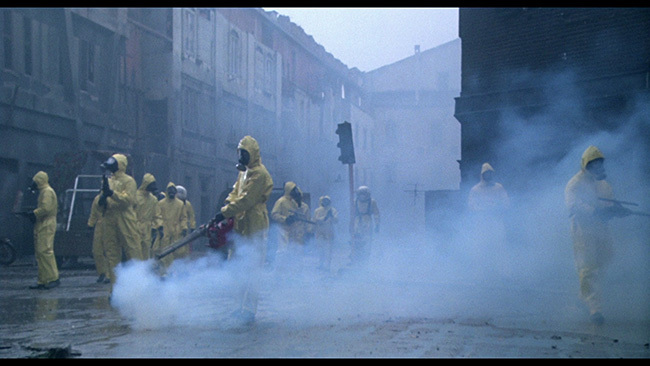 Here, over the span of twenty-five-minutes, we hear about how they came to be involved with the production, working with Claudio Fragasso and Bruno Mattei (it involves soccer! 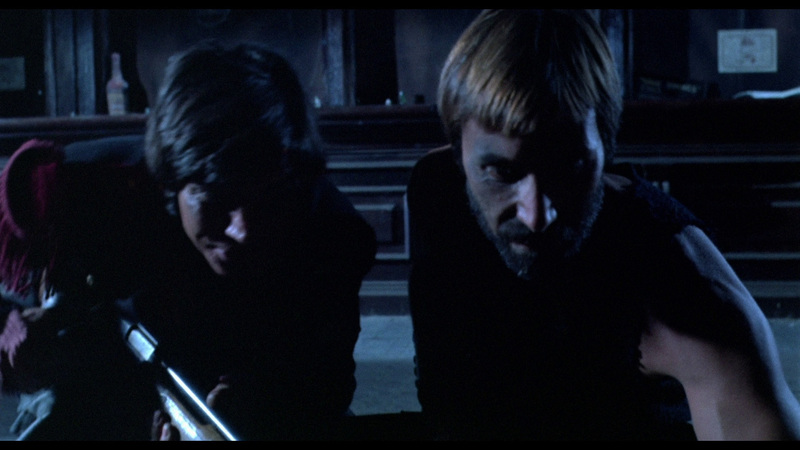 ), working in The Philippines, their involvement with Fulci’s Zombie 3, and how with many of these films they did whatever was required of them, be it acting or stunt work or even helping out behind the camera. This one is quite interesting and a good bit of fun as well. 88 has also included a new interview with composer Luigi Ceccarelli that clocks in at just under nineteen-minutes and is entitled The Pied Piper. In this piece, Ceccarelli speaks quite candidly about where his passion for music stems from, how he got into the industry, his early years spent in a band, scoring films for Joe D’Amato, his thoughts on what good composition should do for a film, the difference between being a great composer and composing great soundtracks, collaborating with Vangelis, and then of course his work on Rats and his thoughts on all of that. Again, this is a good piece that sheds some welcome light on a sometimes underappreciated aspect of cult movies, Ceccarelli is an interesting guy and a great interview subject. A theatrical trailer for the feature, menus and chapter selection round out the extras on the disc. Once again, however, 88 Films has gotten pretty fancy with their packaging. Not only does the first pressing come with a nice reversible sleeve featuring English artwork on one side and Italian art on the reverse, we also get a limited edition ‘gloss O-card slipcase’ and a 150gsm fold out poster included inside the case alongside the disc and a color insert booklet containing an interview with actress Geretta Geretta conducted by Calum Waddell where she talks about her background, upcoming projects, the convention circuit, and of course, a few of the films she worked on. It’s a good read. 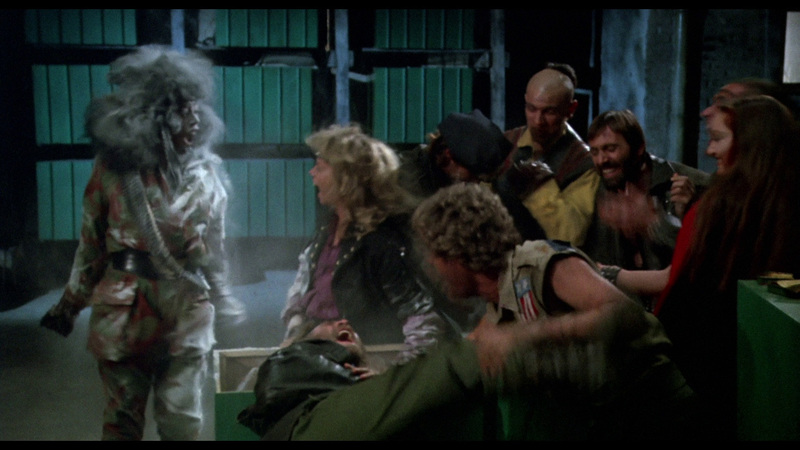 Rats: Night Of Terror is every bit as goofy as it sounds but it’s also a Hell of a lot of fun. This might not convert those who don’t already appreciate Bruno Mattei’s specific set of skills, but for those with an affinity for his madcap style, it’s pretty much a sure thing that you’ll enjoy this one. 88 Films’ presentation is decent and there’s some quality supplements and genuinely nice packaging here to appreciate as well. 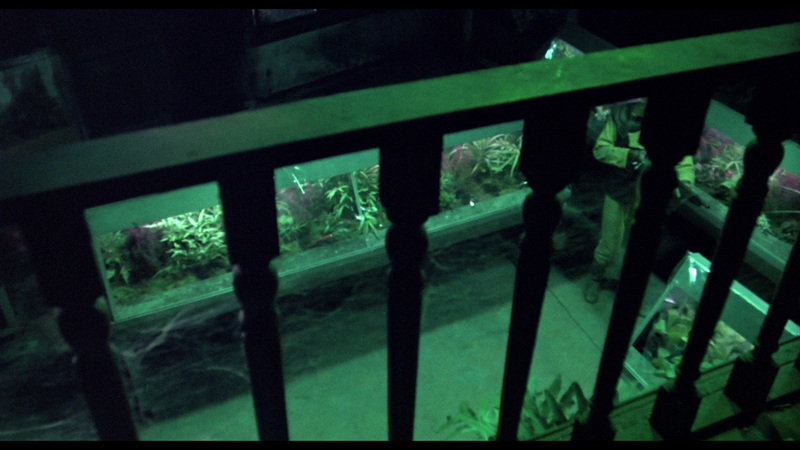 Click on the images below for full sized Rats: Night Of Terror Blu-ray screen caps! Seems to be the same scan. 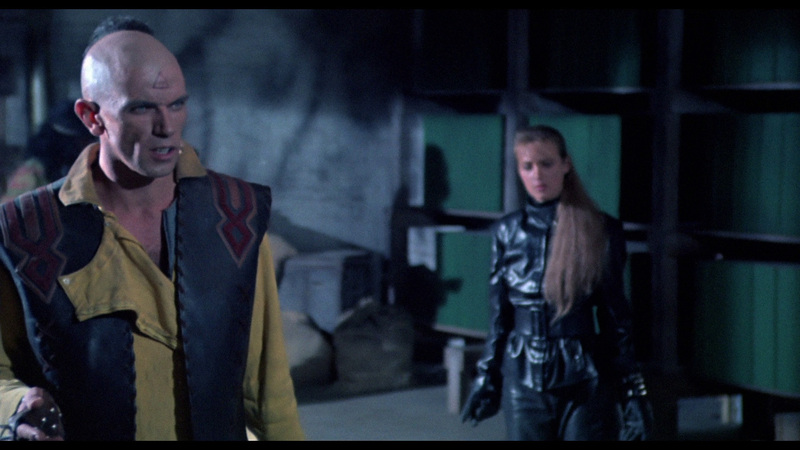 Wasn't this or HELL frame-cut ala Celestial's Shaw Brothers releases?